Fantastic location, super comfortable apartment and great host! Beautiful flat, ideal location, but VERY VERY noisy. Location was great, so central to everything. Walking distance to attraction shops, with buses and taxis directly out front. 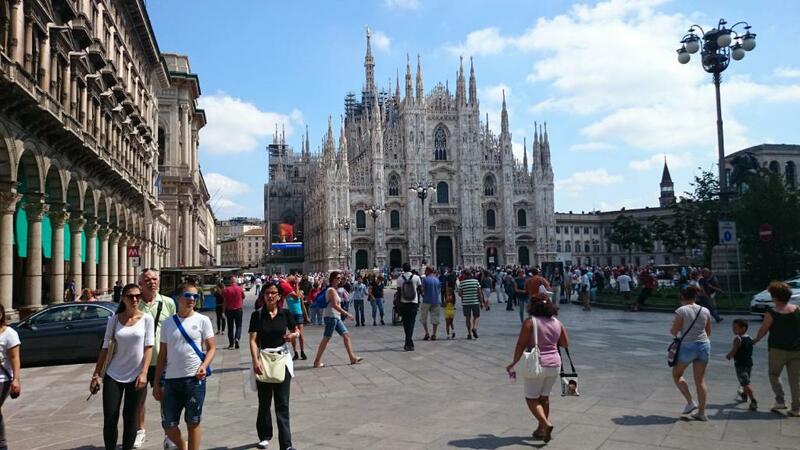 The location is first class, just yards from Piazza Duomo and great shops and places to eat. The loft is secure, you need key to access the roof terrace and the steel door to the flat itself. The decor is modern and quirky with good use of the small space. This is a studio apartment so dont expect lots of room. Its great for a short stya. The facilities were more than adequete with TV, Kitchen with great selection of utensils, the bed was large and comfortable and there was a lot of storage for clothing and luggage. The bathroom was modern and small and provided a few basic toiltetries: shampoo, shower gel and toilet roll. Amazing location, right on the main square. Beautiful restaurants around. Beautiful building and super private location. The location of the flat in duomo was excellent. It was right in the heart of the square. Public transport right at the doorstop. The flat was a small modern studio type flat with new looking facilities. The cleaner met me at the door, handed over the keys and explained about the flat. She was lovely. The owner communicated well on what’s app. Great heating for the middle of winter and nice shower. Loved the size of the flat (very large with all the amenities you could want) and the LOCATION!! We couldn't believe that we could find such an exceptional 'large' flat, at an excellent price and only a block from the Duomo, shopping and the best cafe's for our morning and afternoon meals! Our host was very attentive and gave us an exceptional recommendation for dinner - da Bruno's! If staying here, don't miss the opportunity to eat the most amazing dinner at da Bruno! Fabulous location and a nice big studio. The host was super helpful. Lock in a great price for Flat in Duomo - rated 8.8 by recent guests. One of our bestsellers in Milan! Boasting an amazing location on Piazza Duomo square and a few steps from Milan Cathedral, Flat in Duomo is at the historical heart of Milan. It offers an apartment and a modern air-conditioned studio with private terrace. Offering free WiFi, the Flat in Duomo studio and apartment includes a flat-screen TV, iPod docking station, washing machine and dishwasher. There is a fully equipped kitchenette for the maximum independence. The property is in the very centre, within walking distance of the Scala Opera House, the Museo del Novecento museum, the Royal Palace and Fashion District. You can find the Line 1 Metro in front of the building, offering links across town. Private parking is available on site, at extra charge. Flat in Duomo has been welcoming Booking.com guests since 4 Sept 2014. When would you like to stay at Flat in Duomo? This modern air-conditioned studio features free WiFi and a private terrace. It includes a fully equipped kitchenette, a washing machine, flat-screen TV and iPod docking station. There is private parking on site, available at extra charge. Private parking is possible at a location nearby (reservation is not needed) and costs EUR 22 per day. Rooms are 65 square metres. Gli appartamenti sono molto deliziosi e particolari in quanto piazza del Duomo è una zona caratterizzata dalla presenza di uffici e negozi e non è facile trovare un appartamento residenziale. Essendo nel cuore di milano, proprio in piazza del duomo, avrete a disposizione tutte le principali attrazioni turistiche della città di milano senza bisogno di spendere ulteriore denaro per i mezzi di trasporto. House rules Flat in Duomo takes special requests - add in the next step! ATM card Flat in Duomo accepts these cards and reserves the right to temporarily hold an amount prior to arrival. Flat in Duomo accepts these cards and reserves the right to temporarily hold an amount prior to arrival. Please inform Flat in Duomo in advance of your expected arrival time. You can use the Special Requests box when booking, or contact the property directly with the contact details provided in your confirmation. Very noisy. Constant noise from air machines over whole night. Excellent location and very nice flat. Traffic noise was awful. We didn't sleep well at all. It was all good and what we expected. TNothing under the control of the owner...the external noise. This is a city centre flat so expect the noise thourghout the night.... trams, people laughing, screaming, shouting, workmen drilling, sirens, pigeons, shop alarms etc etc. This canno tbe helped, just expect it and bring ear plugs. Super kind and friendly staff, excellent location, good value! Apartment smelt of cigarettes which host was surprised by so maybe it's uncommon. Would have liked a small table to be able to sit down rather than sitting on the bed to drink coffee and eat food. Only some of the photos in the description are for the flat we were staying in, so I was a little disappointed as I thought I was booking a more spacious apartment with couch and table. The photos are probably for more than one apartment. We were meant to leave our bags with the reception lady and give her a tip of 20 euros to have our luggage till our flight was due to leave but she was exceptionally rude to my Italian friend that we went to a bar around the corner for half price and excellent service and they held our bags till we were ready to go. This isn’t the owners fault as he was trying to provide a service but a small smile from a receptionist goes a long way.